kOZMIC Press is now seeking contributors for a new anthology, tentatively entitled Children of Time: The Companions of Doctor Who. This anthology will feature new essays covering each television companion and as many companions from Big Finish, comics and novels as possible. Proceeds from sales of this book will be donated to FurKids, Inc, an animal rescue and no-kill shelter in Atlanta, GA. Because just like Jamie, Tegan, Rose, Donna and Charley are the Doctor’s companions pets are our companions. Please click here to learn more. 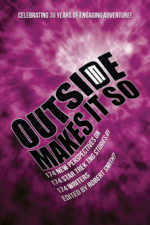 A new essay collection celebrating the 30th Anniversary of Star Trek: The Next Generation will be released on September 28 – the day of the anniversary – and includes an entry by R. Alan Siler called “A Glimmer of Hope.” It’s about the Season One episode “Haven” and addresses a turning point for both Counselor Troi and the series itself. The collection includes contributions from great writers like Keith R. A. deCandido, Rich Handley, Jim Beard, Robert Greenberger, David A. McIntee and many others. All proceeds from sale of the book go to support AVERT: AVERTing HIV and AIDS, a worthy cause, and all contributing authors waived fees in order to fully support this charity. I just recorded a very enjoyable podcast with the great folks at Earth Station Who, a Doctor Who podcast that’s part of the Earth Station One network. I got to talk a little about my book, Doctor Who’s Greatest Hits, and also about one of my all-time favorite Who stories, “The Seeds of Doom.” As soon as the episode is available online I will post a link here. Readers should definitely check out Earth Station One and its affiliate shows. Or come meet them at a local convention! 8/26: Copies of Doctor Who’s Greatest Hits are on their way to their very first retail home. Thanks very much to Green Dragon in Charleston, SC for ordering copies! If you live in the Charleston area, stop by next week to pick up your copy! Author R. Alan Siler has put together a list of the top 55 Doctor Who television stories of all time. From Autons to Zygons, from William Hartnell to Peter Capaldi, this book has something for everyone. As a convention staffer and orgnanizer, Siler is often asked questions like “What’s the best Doctor Who story / episode ever?” “I’m new to Doctor Who, where should I start?” “I want a good introduction to each of the Doctors . . . what’s the best ones to start with?” Here are the answers to those questions. These are the best of the Doctor’s televised adventures, with broadcast information, reviews and behind-the-scenes data on each one. A great book for beginners, but there’s something for the longtime fan as well. The book will be debuting at DragonCon 2015 (September 4-7).